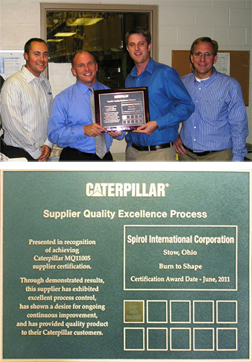 Stow, OH, USA (June 30, 2011) — SPIROL International Corporation is pleased to announce the recent achievement of the CAT Bronze Certification as a part of Caterpillar's Supplier Quality Excellence Program (SQEP). SQEP (Supplier Quality Excellence Process) is Caterpillar's operational excellence initiative that recognizes a supplier's commitment to meet and sustain high quality standards. SQEP incorporates industry proven quality tools and system requirements (ISO, APQP, FMEA, PPAP, SPC, TQM, delivery, etc.) that ensure suppliers achieve superior capabilities and deliver best-in-class performance. Caterpillar developed this program to place a renewed emphasis on supplier performance excellence. The SQEP certification is awarded to suppliers that have achieved the highest levels of quality, delivery, process control, and six-sigma. SPIROL's Quality Manager, Mark Scott, reported that "not only does the CAT Bronze certification recognize SPIROL for our commitment to providing the highest quality product; this is an important award because it means we receive preferred status on new business." PHOTO ? From right: Tom Dahlin and Mitch Keller from Caterpillar's Global Purchasing Department, present SPIROL's Jeff Koehl, CEO, and Justin Singleton, Ag/Heavy Equipment Market Segment Manager, with the CAT Bronze Certification Award. SPIROL is a leading manufacturer of a diverse line of engineered components for fastening and joining, including Precision Shims, Coiled and Slotted Spring Pins, Solid Pins, Disc Springs, Alignment Dowels and Bushings, Spacers, Compression Limiters, Machined Nuts, Threaded Inserts for Plastics, Pin and Insert Installation Equipment and Vibratory Parts Feeders.